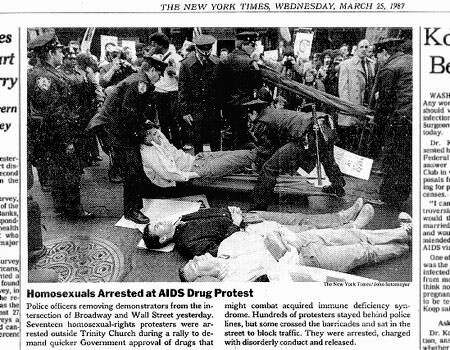 The first ACT UP protest, as covered by the NYT. ACT UP and Keith Haring Art from the Whitney Collection. The “Downtown Collection” at NYU’s Fales Library has a huge archive of papers from Alan Klein. as a prominent member of ACT UP, an AIDS activist group that formed in the 1980s, Klein kept consistent and through documentation of the group’s work. The Alan Klein Papers at Fales span Klein’s involvement in ACT UP, as well as later Queer Nation. The finding says that the collection spans form 1980 to 1995. As well as crossing a number of activist organizations, Klein’s papers also span just about the entirety of the AIDS epidemic. The artifact I chose to work with is a flyer from an outreach campaign aimed at women – specifically lesbian and bisexual ones. The flyer, title “AIDS: A Lesbian Issue?” is text heavy. So much of the media coverage of AIDS was incorrect or biased. At the beginning of the epidemic, the disease was called GRIDS – it was labelled a “gay disease.” Incorrectly, women and straight people were often told to ignore the disease; it was thought to be impossible for them to acquire. As AIDS spread, it became clear that this was entirely false. ACT UP worked to change the perception of AIDS by informing the public about its true nature. It would be a mistake to understate the impact that AIDS had on the gay community. Young men were disproportionately affected by the disease. The CDC estimates that of over 50,000 reported cases between 1981 and 1987, 92% of those were male. Of those cases, 95.5% or 47,993 were deceased. Between 1981 and 2000, over 200,000 people in the United States were reported to have HIV/AIDS. However, ACT UP did not want to limit education to queer men. Outreach committees worked to educate the media, as well as other population. This leads us back to my artifact. The flyer was coordinated by the Women’s Committee of ACT UP. The title, which I already discussed briefly, is eye catching. The flyer works to prove to the readers why they should care about the AIDS crisis. But it does not do that solely by making the issue about women. Instead, it informs and then expands, ultimately tying back the issue to ACT UP as a whole. The flyer uses language that is incredibly inclusive. This, it seems, is one of its greatest strengths as an educational tool. It does not hold its reader to a moral standard; it – and therefore ACT UP – shows a level of care and consideration for the women reading. By informing readers the way that women can acquire AIDS, it does not place judgement on the number or “type” of sexual partners, nor does it criminalize the use of IV drugs – another way that HIV spreads. The goal of the artifact is to be more open and communicate clearly about the disease. The flyer does not stop at basic health information. It ties the issue back to the wider AIDS epidemic and urges the reader to get involved. In just five bullet points, the flyer addresses the racist, sexist, and homophobic nature of media coverage and studies devoted to AIDS treatment. ACT UP used repetition to solidify their message in a variety of campaigns. One slogan, which became a signature chant at protests was “ACT UP, Fight Back, Fight AIDS.” The phrase “Fight back!” was used in a variety of other chants as well. 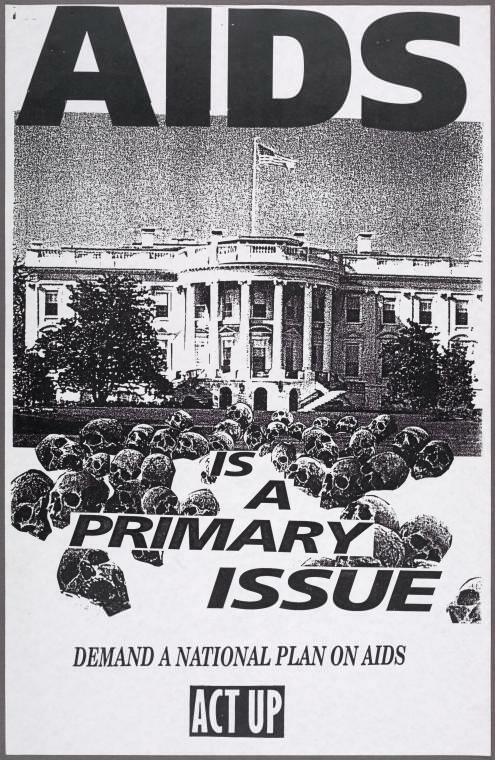 Another widely used slogan, which can be seen in the Keith Haring art and images from the protests was “SILENCE = DEATH.”” At protests, these chants were used to solidify the message of the fight against not only AIDS, but the systems of power and bureaucracy in place that were ultimately killing thousands of people across the United States. The tactics of ACT UP were used to effectively garner support and understanding of those suffering and dying form the disease. The activist group increased involvement beyond the gay community and educated those both in and outside the LGBT sphere. The tactics and methods set in place by ACT UP are still used by the group today, as well as huge number of other organizations that take inspiration from them today. Manuscripts and Archives Division, The New York Public Library. “AIDS is a primary issue. Demand a national plan on AIDS.” New York Public Library Digital Collections. Accessed March 9, 2018. “ACT UP Capsule History.” ACT UP New York. Acccessed March 9, 2018. Manuscripts and Archives Division, The New York Public Library. “ACT UP. [Activists at subway station. ]” The New York Public Library Digital Collections. 1989. Manuscripts and Archives Division, The New York Public Library. “Silence = Death” The New York Public Library Digital Collections. 1969 - 1997. 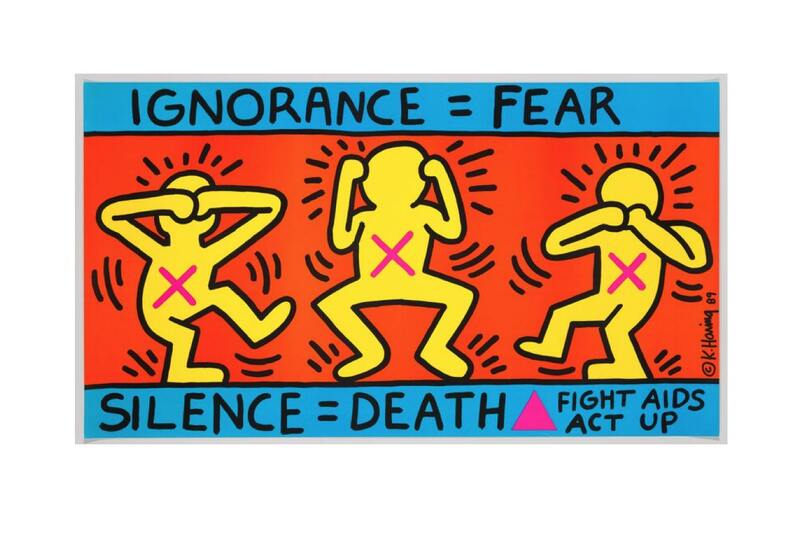 Haring, Keith.”Ignorance = Fear / Silence = Death.” 1989.